Nendoroid Sanada Yukimura Teaser by Phat! Whoa … what is this!? 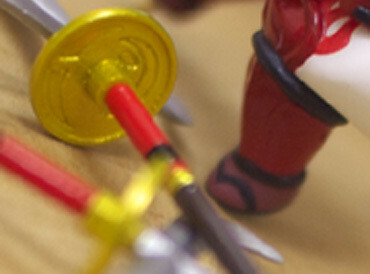 That spear … that red armor … they look awfully familiar, don’t they? Yep, it looks like Mikatan’s words is coming true afterall. Nendoroid Sanada Yukimura will be finalized and revealed in the coming days, after being displayed for the first time at Summer WonFes 2010 and mysteriously absent from the last February WonFes. Well, what do you think, Nendonesian? Have you been waiting for the Nendoroid rendetion of Date Masamune‘s archrival as well? This entry was posted in News and tagged nendoroid, sanada yukimura, sengoku basara. You are wrong, it has been shown for the first time during the Wonder Festival 2009 !!! It was just a picture on a poster ! And at this time the release date was planned for Décember 2010 !!!! Well, I refer to the prototype though. Nendoroid Ignis was in Summer 2008…. I don’t know if they abandonned the project… maybe because no news !!! But GSC has never said officially that it was abandonned it. For Sanada, I can’t put the link I am at work and my computer is crappy and don’t want me to copy-paste !